Behold, the Ark of the Covenant! So, apparently this is a groom’s cake. Kind of impressive. Because it looks more real than tasty. And I always appreciate creative groom’s cake at wedding receptions, and this is cool. Now, I doubt anyone died when they touched (edit: ate) this cake because it didn’t contain The Law…it probably contained The Chocolate or The Vanilla. 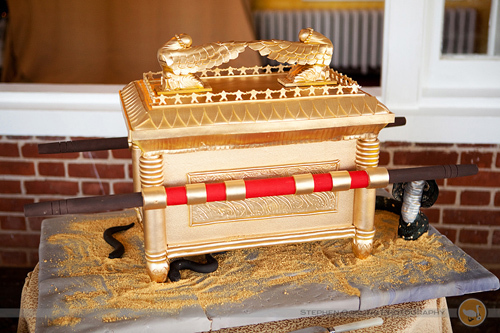 Because I’m Catholic, it’s easy to draw the parallels between the real Old Ark of the Covenant , the real New Ark of the Covenant, and the real Cake Ark of the Covenant. The Old Ark contained the tablets of which God inscribed His commandments and instructed Moses and his followers to erect a very holy box to hold The Law (see Exodus and onwards). And then there’s Mary, Mother of God, who is considered as the New Ark of the Covenant because she carried within her The Fulfillment of the Law–Jesus. And Jesus’ Body is consumable because we need it for life (see John 6). 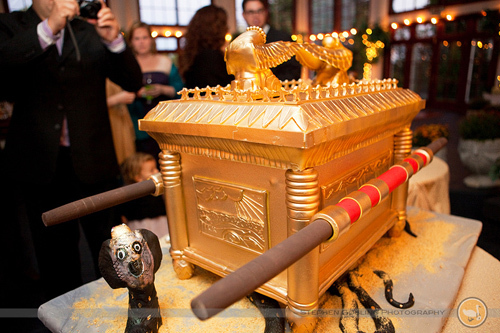 And now there’s this Cake Ark of the Covenant, which contains the Law That One Must At Least Have One Bite. Or something. Faith. Hope. Charity. Biblical cakes.